User warning : The following module is missing from the file system: exchange. For information about how to fix this, see the documentation page. dans _drupal_trigger_error_with_delayed_logging() (ligne 1143 dans /home/oldctif2018/public_html/includes/bootstrap.inc). CTIF was founded in 1900 in Paris for encouraging and promoting co-operation among fire fighters and other experts in fire and rescue throughout the world. 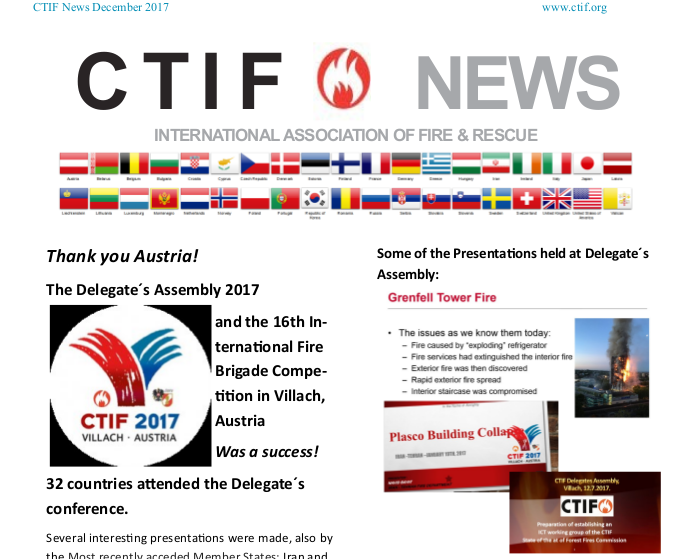 CTIF organises international conferences and competitions attended by more than 3.000 fire fighters and youth fire brigades from around the world. CTIF develops comprehensive world fire statistics by publishing annial reports which offer data on fire issues from 80 different countries and 90 capital cities. Dear members of the CTIF Commission “Voluntary Fire Service”! Dear Commissioners, in the Annex you will be invited to the next meeting of the International Youth Leader Commission in Luxembourg. The 4 th meeting of the CTIF working group „voluntary fire service“ took place on April, 3 rd in BERLIN, Germany.